Yes, you read that right: this chocolate and peanut butter fudge contains only four ingredients. And despite what you may be thinking, those ingredients don’t include sugar, butter, condensed milk, or anything else you might expect to find in fudge. This fudge is made from peanut butter, dark chocolate, coconut oil, and maple syrup. That’s it. I know, it’s magical, I was pretty amazed myself. I based the recipe off this one from Texanerin Baking, but I added chocolate because what’s not improved by chocolate? I was recently challenged by Clarks to make a recipe using one of their natural sweeteners, which include maple syrup, honey, carob syrup, agave syrup, and a newly launched date syrup. I thought this peanut butter fudge was just the thing! Compared to refined sugar, maple syrup has more than 30% less sugar per 100g, and more than 30% fewer calories – so you’d be forgiven for calling this a (slightly!) healthier version of fudge. Maybe. If you squint hard enough. I used dark chocolate rather than milk chocolate, to again cut down on the sugar content while still giving a really rich and creamy fudge. The flavour of the chocolate alongside the slightly salty peanut butter is seriously good. I should warn you, this chocolate and peanut butter fudge isn’t the (for lack of a better word) fudgiest of fudges. It’s quite soft and sticky, and seriously melts in your mouth. It’s absolutely amazing – but it’s best kept refrigerated to keep it as firm as possible. Do you often use natural sweeteners, or are you more of a refined sugar kind of person? I definitely use normal sugar some of the time (mostly for baking, or making a cup of tea for the plumber once a year when he comes to service our boiler), but you can’t beat a good drizzle of maple syrup or honey on porridge or yogurt. If you’re into natural syrups, don’t miss Clarks at the BBC Good Food Show at the NEC in Birmingham from 24th – 27th November – they’ll be giving away plenty of samples, recipes, and information about natural sweeteners. To celebrate their appearance at the Good Food Show, Clarks are giving away a luxury spa break for two at Champneys – check out their Twitter and Facebook pages for more details, and good luck! Add all four ingredients to a saucepan, and place over a medium heat. Stir thoroughly until the mixture melts together. Bring to a simmer, and cook for a couple more minutes, stirring constantly. Transfer the chocolate mixture to a lined, greased dish. When cooled, place in the fridge, and leave to set overnight. When fully set, turn the fudge out from the dish, and cut into chunks. You may find it easier to cut if you dip the knife in hot water first, since it's quite sticky. Store the fudge in the fridge. Love peanut butter with chocolate? 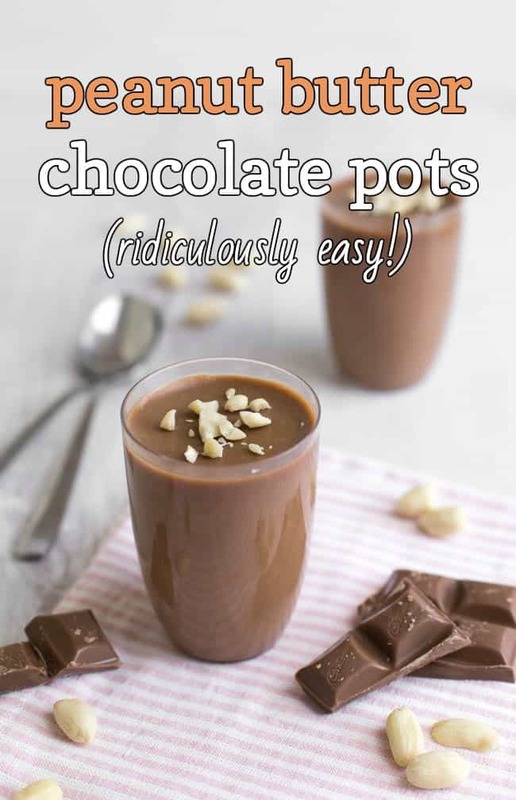 It’s one of my favourite combinations – try my easy peanut butter chocolate pots! Cor blimey this looks more than a little bit lovely!!!! I’m going to make this with the boys to give to their teachers at the end of term and put it in pretty tins – such a gem of a recipe!!!! Haha! I appreciate your enthusiasm :D Hope you enjoy! I love this and have all the ingredients, including the Clarks maple syrup. Bring it on! I thought this will going to be a no cheat day for me since I started to eat right, which means no carbs, no sugar. However, upon reading the ingredients, I was totally blown away since my love for chocolate will never fade and adding natural sugar for his is fabulous. Thank you for sharing this recipe. This fudge sounds great, would make a really nice Christmas present too! Does this need 100% peanut butter or ‘standard’ peanut butter? Oh Becca, what are you doing to me? I am going to have to make this fudge now. Peanut butter and chocolate are such a good combination and maple syrup is gorgeous. I use maple syrup and date syrup quite a lot, so it’s useful to know Clark’s now do a version of the latter. Mmmm I think I will definitely be making this as a dessert for Thanksgiving this year! I LOVE fudge, and my husband loves peanut butter- so it’s perfect! Oh this is exciting, I love maple syrup and your fudge recipe looks so simple I’m definitely going to give it a go. These look utterly gorgeous, and I love the flavour combo of peanut butter, chocolate and maple syrup! I’ve not tried the Clarks products before but liking the sound of their range. I really want to try their new date syrup, sounds amazing! Peanut butter and chocolate is always a winning combination!